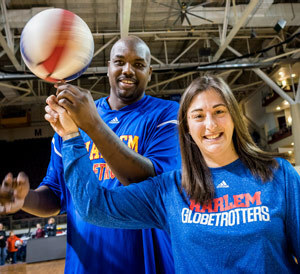 Stephanie Guzzo ’07 on the court with the Harlem Globetrotters. Become an expert in prevention, emergency care, diagnosis, treatment and rehabilitation of injuries and illnesses. As a certified and licensed health care professional for the physically active, you will support and guide individuals in their quests for a safe approach to work, life and sport. Colby-Sawyer’s Bachelor of Science degree in athletic training prepares you to design and implement individualized treatment, rehabilitation, reconditioning and prevention programs for athletes and the physically active. Hands-on classes, research in the college’s human performance lab, a Capstone project, and required internship and clinical experiences prepare you for the Board of Certification Exam to become a certified and licensed athletic trainer. Understand the physiological responses of human growth and development as well as the progression of acute and chronic injuries, illnesses and diseases. Recognize, intervene and appropriately refer treatment for harmful sociocultural, mental, emotional and physical behaviors. Recognize the nutritional aspects of athleticism, as well as the indications, contraindications, precautions, interactions and governing regulations of medications relevant to the treatment of injuries. Earned a master's degree in athletic training from Old Dominion University and is Head Athletic Trainer at Granby High School in Norfolk, Va. Learn how to develop, administer and manage athletic-related health care facilities and associated venues, and to appreciate the professional responsibilities, opportunities for professional development, and national and state regulatory standards for the practice of athletic training. Five required clinical experiences supplement your academics, build your resume and prepare you for a successful career in professional sports, sports medicine clinics, academic, corporate or industrial settings, or graduate studies in athletic training, physical therapy and allied health fields. The Colby-Sawyer College Athletic Training Program is accredited by the Commission on Accreditation of Athletic Training Education (CAATE). Students who graduate with a degree in Athletic Training are eligible to take the Board of Certification (BOC) Athletic Training Certification Examination. Learn more about the Athletic Training Program accreditation.